It’s hard to believe that our second round of expeditions is almost here. It seems like just last week when we were paddling the Rio Baker and exploring Patagonia National Park. Since arriving back in Idaho, classes have been in full swing. But, behind the scenes, people are working hard to plan for our Idaho expeditions. In about two weeks we will drive a few hours southwest to the Owyhee Canyonlands near the border of Idaho and Oregon and set out for two weeks of fun. 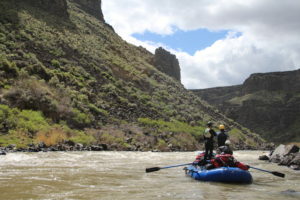 Early this week our Director of Expeditions, Justin, went on a solo scouting mission down the Owyhee River to access the river expedition situation. He was checking water and snowpack levels to determine if the river will be high enough for our groups, as well as looking for any changes in the river or campsites that might impact the trip. Scouting for campsites on the Owyhee River. Our Expedition Food Coordinator is working to plan delicious meals for our trips. Ordering and packing expedition food for almost 50 people for 12 days is a complex process, but Jono makes it look easy. Just for reference, an average person on expedition will eat about 150 grams of pasta for one meal. Say we eat pasta 4 times in the 12 days we are out; that means we will need about 65 pounds of pasta. That’s a lot of pasta! Students have their own list of things to take care of before setting out. Many students quickly realized that they over packed on our first set of Chilean expeditions. They are now thinking about how to pack more efficiently and how to narrow down their lists to just the essentials. Everyone has their own systems and the first round of expeditions was a useful experience for students that hopefully taught them how to improve their packing for the upcoming trips. While classes are still taking place, people are slowly starting to get ready for expedition. Planning is taking a bigger portion of everyone’s headspace and you can feel the excitement growing in the community.